When the term postfeminism entered the media lexicon in the 1990s, it was often accompanied by breathless headlines about the death of feminism. Those reports of feminism's death may have been greatly exaggerated, and yet contemporary popular culture often conjures up a world in which feminism had never even been born, a fictional universe filled with suburban Stepford wives, maniacal career women, alluring amnesiacs, and other specimens of retro femininity. In Feminism and Popular Culture, Rebecca Munford and Melanie Waters consider why the twenty-first century media landscape is so haunted by the ghosts of these traditional figures that feminism otherwise laid to rest. Why, over fifty years since Betty Friedan's critique, does the feminine mystique exert such a strong spectral presence, and how has it been reimagined to speak to the concerns of a postfeminist audience? To answer these questions, Munford and Waters draw from a rich array of examples from contemporary film, fiction, music, and television, from the shadowy cityscapes of Homeland to the haunted houses of American Horror Story. 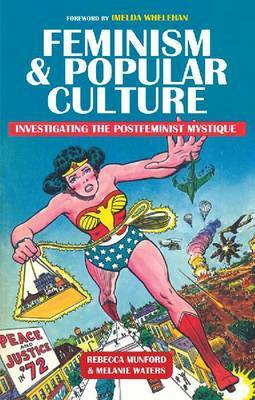 Alongside this comprehensive analysis of today's popular culture, they offer a vivid portrait of feminism's social and intellectual history, as well as an innovative application of Jacques Derrida's theories of hauntology. Feminism and Popular Culture thus not only considers how contemporary media is being visited by the ghosts of feminism's past, it raises vital questions about what this means for feminism's future.